Chicken Little once said that the sky is falling. Yet it still remains intact above us. So while the transition from magnetic stripe to EMV might seem like a shift of cataclysmic proportions, the sky is not falling. Your company will successfully transition from magnetic stripe to EMV (many already have), and next time you look outside your window, you’ll see the billowy clouds resting above, and not on the ground. Yet we also understand that with anything new comes fear. It’s normal. So we’ve put together a few facts to calm your nerves. We want you—the sagacious business owner that you are—to continue to make calm, smart decisions over the course of the transition. A transaction using EMV technology will take around 60 seconds compared to under 2 seconds with a magnetic stripe card. Magstripe cards are swiped and provide the terminal with the credit card number and expiration date, which can be easily copied by a card reader. 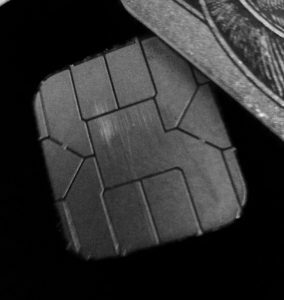 EMV terminals, on the other hand, require customers to “dip” the chip and verify customer data, which takes just a short while longer. During this time, the Chip and Terminal begin a conversation. Chip says, “Please authorize this transaction.” Terminal replies, “I’ll need to make sure you’re valid. I’ll also need to provide your card with a special code unique to this transaction because we can’t have any fraudsters trying to take your info.” Chip responds, “Sounds great.” Terminal says, “Now please sign, or enter your pin number.” EMV takes a few more seconds than a magstripe transaction, but your data is more secure. Don’t panic. Although EMV has been adopted in Europe for over a decade, cards in the US still have a magnetic stripe. Card companies have accounted for the ongoing transition by allowing terminals to still accept magnetic stripe cards. Card issuers expect the full transition to take anywhere from three to five years. The term “liability shift” sounds pretty intense, like if you’re not prepared, the earth will shift, and you’ll fall off the edge of it. Oh, Copernicus. Well, flat-earth jokes aside, the liability shift is not that cruel. It is simply a method to eliminate fraud. Starting October 2015, the party—either the business or banking institution—with the lesser technology will be responsible for the cost of fraud. Instead of thinking of the liability shift as a way for others to make money off of your hard work, think of it instead as a way to ensure all parties are working together to eliminate fraud, which cost US consumers $16 billion last year alone. In short, the sky is not falling, and EMV is not the end of the world. Instead, it seems to be the beginning to new possibilities for business owners. It might be an uncharted territory, but EMV will provide companies with the tools to chart their own course by allowing them to directly address fraud, a concern that leaves many involved feeling powerless. So next time you look at the sky, we at COCARD hope that you view it with possibility, and nothing less than that.